"I can't give up now. This is what Christmas is all about." Maybe it's some deeply buried seasonal spirit, but when it comes to Christmas movies, it's tough for me to be extremely critical. For the most part, the predictably manipulative message of someone discovering the "real meaning" of Christmas, while maybe not necessarily cutting-edge, generally manages to tug at the requisite heart strings. 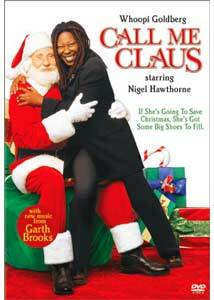 This Whoopi Goldberg production of Call Me Claus doesn't break any new ground, but it does dish out a nice spin on the legend of Santa Claus. Lucy Cullins (Goldberg) is a bitter, edgy producer for the Shop-A-Lot home shopping channel put in charge of selecting a new Santa Claus for the station's seasonal "Kristmas Korner" show. A man claiming to be Santa Claus (Nigel Hawthorne) enters Lucy's life, and unknown to her, has singled her out to become his replacement as the real St. Nick. It seems that each Santa can only reign for 200 years, at which time a suitable replacement must be found, or the dreaded "Or Else Factor" will occur, which will bring about the end of the world. It's up to Santa Claus to teach the curmudgeonly Lucy to change her selfish ways, and learn to accept the true meaning of Christmas. Or else. Admittedly there aren't a lot of surprises here. Lucy is overly caustic and mean, as a result of her father dying in Viet Nam, during the Christmas season, when she was a child. Her broken spirit has made her into a cranky, irritable person who over the years has alienated herself from her family. Goldberg does a lot of eye rolling, and mines some mean-spirited laughs from the role, but pretty much sleepwalks through a one-dimensional characterization. The kindly Santa, played perfectly by Hawthorne, is on par with Edmund Gwenn's classic portrayal of Kris Kringle in the original Miracle On 34th Street. His "on-air" sales pitches of gaudy Christmas merchandise is nicely done, and he delivers the required dramatic "meaning of Christmas" speech like a natural. The question of whether or not Santa can convince Lucy in time is never really up for discussion; after all, this is a Christmas movie. One of the things that give this release a slightly higher profile is that it features a number of seasonal songs done by Garth Brooks, who just happens to be one of the executive producers of Call Me Claus. The songs by Brooks, as well a score by the legendary Van Dyke Parks, give the film a nice Christmas feel. I won't nitpick too much and overanalyze Call Me Claus, because it is doesn't try to be anything more than retelling of a story that, while old hat, still generates some of those warm, fuzzy feelings. The only thing that marrs this otherwise pleasant family film is a brief scene where a drunken Santa-wannabe harrasses a waitress and makes comments about his "North Pole." That joke seemed a little out of place, and didn't really match the lighter tone of the rest of the film. Image Transfer Review: The 1.33:1 full-frame transfer on this disc is comparable to any typical television movie, with nothing exceptionally good or bad one way or the other. Colors don't bleed, and remain well-saturated. No noticeable blemishes to be found here, which isn't too surprising considering that it is a fairly new film. Audio Transfer Review: Much like the image transfer, the 2.0 Dolby surround mix is perfectly adequate. Nothing here to really push your home theater system to it's limits, but what there is provides a clean dialogue track, with minimal imaging. The Garth Brooks songs, as well as Van Dyke Park's original score, sound sharp. Primarily resigned to the front channels, there are however a few subtle rear channel music cues that give the sound field a little depth. A rather plain, no-frills sound mix. Extras Review: This disc's supplementals don't really merit much mention. The 05m:30s In The Studio With Garth Brooks featurette, in which the country music superstar (and executive producer of Call Me Claus) chats generically about the film, is pure fluff, and doesn't provide any real depth or insight. Aside from Columbia TriStar's extensive subtitle options (English, French, Spanish, Portuguese, Chinese, Korean and Thai), there are 28 chapter stops and trailers for an oddball assortment of titles (Annie, Bye Bye Birdie, Buster & Chauncey's Silent Night) that complete the generally lackluster extras. Not as funny as Bill Murray's Scrooged, or as touching as Miracle On 34th Street, Call Me Claus falls along the same lines and tosses out a predictable "feel good" story that tries to deliver a nice message mingled with a few laughs.